Blue Origin's New Shepard rocket launched and successfully landed in West Texas on Dec. 12, 2017, carrying a crew capsule that brought a variety of experimental payloads into microgravity for a short time. Astronauts who suffer chest trauma such as a collapsed lung could soon have a new technology to save their lives: The payloads aboard Blue Origin's suborbital test flight Tuesday (Dec. 12) included a NASA-funded space technology that could treat the dangerous injury. If an astronaut suffered a collapsed lung, the crew would have to return to Earth immediately. That's because collapsed lungs are treated with gravity-dependent collectors that don't work in microgravity, NASA officials said in a statement. "My hope is that in the future, this type of medical device will be able to save the life of an astronaut, to continue their mission of exploration," Charles Marsh Cuttino, founder of Richmond, Virginia-based Orbital Medicine and who led the development of the device, , saidin the statement. "These types of medical treatment options could be required to explore the moon and Mars." The experiment was constructed in collaboration with the Purdue University School of Aeronautics and Astronautics in Indiana and flown in cooperation with NanoRacks, a company that manages payloads on board the International Space Station through a NASA Space Act Agreement. 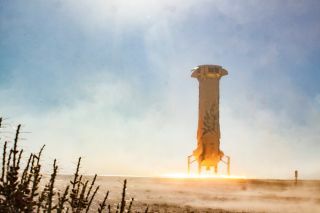 "New Shepard brings new capabilities to the program," Ryan Dibley, NASA's flight opportunities campaign manager for Blue Origin, said in the same statement. "This launch platform allows for larger payloads, provides lower launch accelerations and maintains a sealed pressure environment." NanoRacks is building another frame for flights, which will double the payload volume available to customers on future New Shepard missions, according to the company. "Suborbital flights with Blue Origin offer the perfect testbed before committing to an International Space Station microgravity mission," Mariel Rico, a NanoRacks payload engineer, said in a separate statement. A student payload from DCS Montessori Middle School in Castle Pines, Colorado. The first part was an Arduino Nano mini circuit board that included sensors and was designed and programmed by the students. The second was a school-wide art project. The school partnered with DreamUp (an educational organization that focuses on space) to create a curriculum with this flight as a "teaching moment," the school said in a statement. Two research payloads from Embry-Riddle Aeronautical University. The first payload included mice T cells, a type of cell that helps with immunity, to help develop for new treatments for cancer. This was done in partnership with the University of Texas Health Science Center and the Medical University of South Carolina. The second payload examined how microgravity affects genes that are linked with tumor growth. Blue Origin has said that it plans to start commercial New Shepard flights shortly, with its first crewed flights occurring as soon as next year. New Shepard is intended to fly six passengers into suborbital space for brief flights. Its rocket is designed for vertical landings, whereas the company's crew capsule will parachute separately, safely to Earth. Blue Origin hasn't yet said how much it will cost to ride aboard New Shepard.